David Licauco and Danes Lee are now Kapuso. Meet the newest GMA Artist Center talents, David Licauco and Danes Lee! On September 16, GMA Artist Center welcomed two new promising talents to add to their ever-growing family: David Licauco and Danes Lee! Here are the two signing the contract with GMA Artist Center Sr. Talent Manager Joy Marcelo and AVP for Talent Imaging and Marketing Simoun Ferrer and David and Danes' co-manager Arnold Vegafria. 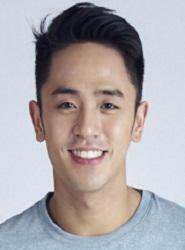 David Licauco works as a model and was the first runner-up of Mr. Chinatown 2014. “I feel thankful and grateful for this opportunity, not everyone is given this once in a lifetime opportunity. I’m excited to work with my fellow Kapuso!” he said. Meanwhile, Danes is the gorgeous sister of Divine Lee. "I feel very privileged with this opportunity. God really has his ways. Not every day [do] you wake up to this kind of chance in life. Dreams do come true, mine just did today,” she shared. IN PHOTOS: Derrick Monasterio signs contract with Regal Entertainment Inc.